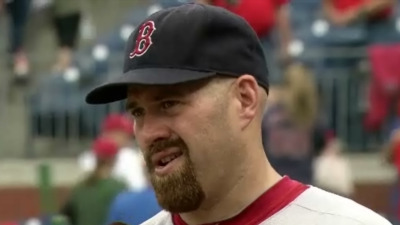 Written exclusively for Fenway Pastoral by Boston Red Sox third baseman Kevin Youkilis. While battling a bad back on the disabled list, Kevin Youkilis experienced an unconventional breakthrough that may save his career. (Photo from NESN.com). As many of you probably already know, my spine has been a bit…embattled lately. The Red Sox put me on the disabled list last week and I’ve been enjoying watching Will Middlebrooks take his first round of major league at-bats. I bruised the poor kid up pretty good after he hit that grand slam on Sunday for his first major league home run. Just a ton of congratulatory punches and noogies and stuff. But I gotta be honest. Not being out on the field battling with the guys is tough. I was just starting to feel like my swing was coming around and I could definitely feel one of those two-homer, nine-ribbie games coming any day when all of a sudden my lower back started barking at me. My new wife, Tom Brady’s sister Julie, could tell I was in a bit of a funk. So she suggested I try to loosen my back up by going to this early-morning yoga class with her. I got pretty mad at her for assuming I was one of those effeminate, metrosexual meditation-type dudes and we had our first shouting match since getting hitched last month. Once it was over though, I realized the best way to smooth things over was to just agree to take the stupid class with her and smile my way through the stupid thing – I figured I’d take some of the pent-up aggression out on my pecs and do some incline bench presses in the weight room once it was over. I’ve always despised the people who walk down the street with those rolled up yoga mats. It’s like, ‘C’mon, you really want everybody to know you’re going to meditate and all that, huh?’. Plus, they’re way too little to properly pad my body from the hard floor. I’m a big guy. So I borrowed one of those tri-folding floor mats from the Red Sox clubhouse. It’s about 20 square feet or so and I had to pull the back seat of my Range Rover down, but it wound up fitting just fine. We got to the gym around 6 a.m. and I figured there wouldn’t be too many people in a class that early. But the room was chock-full and I was pretty happy I had brought my tri-fold mat. It gave me a little extra space and, after backing off some women who tried to overlay their roll-up mats on top of mine with a couple dirty looks, I was in the clear with enough room to maneuver without getting elbowed somewhere unsavory. So anyway the class was a cinch at first. We were doing all these lame stretching and contortion techniques with our bodies. The instructor had a bunch of fancy names for them and I kind of freelanced a little bit since some of them were kind of ridiculous. Per team doctor’s orders, I’m not supposed to bend my knees past certain angles, twist myself into funny positions or sit on the ground like a dainty Lotus flower (OK, fine, that last rule is my own…). Also, some of the things they expected us to do were just plain crazy. I could tell just by the name of the Fetus and One-Legged King Pigeon positions that they weren’t anything I wanted to be a part of. I was seriously crushing the Crescent Moon position (picture me gloving a bad hop at third that almost bounces like three feet over my head, all the while I’m on one knee and bent slightly backward). But, of course, bad luck just had to strike at that very moment. I’d be lying if I told you I had any control over what happened next. The instructor kept telling us to listen to ourselves breathing. In. Out. In. Out. I could feel oxygen rushing through my veins and it felt like I could practically see carbon dioxide pouring out of me as I exhaled. It was a cleansing, Zen experience and all that stuff. It was like I had stepped out of my third-baseman’s physique and was sitting in a box seat, observing the shell of my inner soul reach a scraggly peak of utter consciousness by hitting a 500-foot home run off Roy Halladay. I felt liberated and at complete ease with my baseball career. I couldn’t have imagined anything more soul-enhancing except maybe hitting a grand slam in the World Series to walkoff with the MVP trophy and pig-piling on home plate with all my teammates like a hoard of little kids and then dousing each other in gallons of champagne. So yeah. It was feeling like a real poignant moment in my life. Try to be mature about it, you guys. I wish the rest of my yoga class could have been at least. Instead, all the women around me, including my lovely new wife, turned around and glared at me like I was some sort of inhuman piece of garbage. I know it didn’t exactly seep out gracefully, but there was no reason for people to get all emotional about the whole thing. I’ve never felt so low or embarrassed, especially once they started pointing and laughing. It was like striking out with the bases loaded in the ninth inning of the World Series on one of those just big, violent cuts that aims for the fences but ends up buried in the catcher’s mitt. I mean, I went from having images of hitting a baseball over everything on Landsdowne Street to swinging and missing at strike three and hearing one big Bronx cheer. I guess that’s what farting in the middle of yoga class feels like. In just five short years, I’ve gone from being voted third in the 2008 AL MVP voting to getting snickered at by a bunch of trailmix-eating yoga chicks. I felt so disgraced that I pretended I was out of water and walked out of the room. I hid out in the far back corner of the weight room on one of the leg-press machines for a while but I was too distraught to put up more than a few hundred pounds. Anyway, I’ve been thinking about the whole thing and I know I shouldn’t be ashamed. I reached a level of consciousness and bodily harmony that those girls just don’t understand. My mind feels so clear and my body has a brand new spring in it. Hopefully, this little story clears up any lingering doubts of my ability. I’m not just telling you guys this because it’s a contract year and Middlebrooks is mashing the ball all over the field. When I get back out there, I’m going to murder major league pitching with my swing. I’m just mentally ready to outclass my opponents. And while my defensive first-step may be slower than in my prime, I can anticipate where the batter is going to hit the ball just using my new understanding of the universe. So maybe the whole experience wasn’t a waste time, you know? Farting that day in yoga class seemed to just release all those negative toxins that weren’t doing my body any good. It may have been why my back was feeling so sore and inflexible in the first place. So thank you to my lovely wife, Tom Brady’s sister. All you fans out there can forget about any third-base controversy. I’ve seen the light and you’ll see it too: I’ll be back on the field tattooing baseballs real soon. This entry was posted in Red Sox, The Youker Files and tagged Kevin Youkilis. Bookmark the permalink.